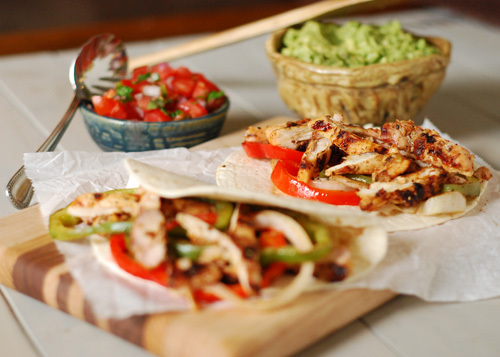 Hop in the Way-Back Machine, this is the first version of "fajitas" that I ever learned to make. Back then I got my recipes off of packages and magazines and used a DOS based recipe program to store them. I got this one by sending an SASE to the Rotel folks to get a pamphlet of Rotel recipes. What is an SASE? Kids, back before the inter-web-thingy, if you wanted information from a company, you mailed them a request with a "self-addressed stamped envelope (SASE)" and they would send you materials like recipes and catalogs. This was shortly after we defeated the dinosaurs. It is a little different in that it marinates the meat and veggies together and it relies partly on the acid in the tomatoes for the marinating effect. Place chicken thighs in a 9 x 13" casserole dish and top with the onion, bell peppers, and garlic. Whisk together the Rotel, beer, lime juice and 1 tsp of fajita seasoning. Pour over the chicken and veggies. Cover and marinate refrigerated for 6-12 hours. 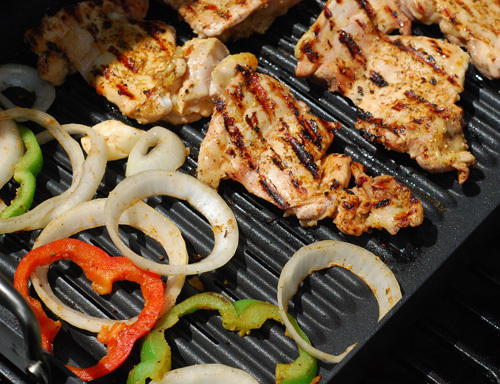 Remove chicken, peppers, and onions from the marinade and discard the marinade. Season with the remaining 2 tsp of fajita seasoning. Grill the chicken, peppers, and onions about 5-6 minutes a side, until the chicken reaches an internal temperature of 165f. Allow chicken to rest for 5 minutes. 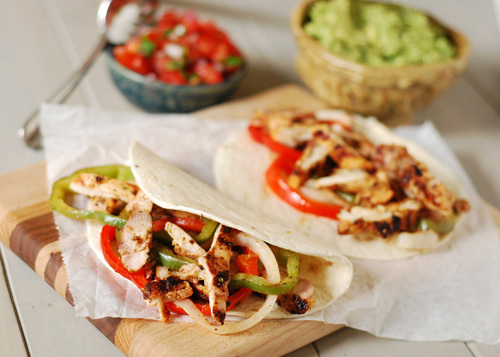 Slice thin and serve on tortillas with veggies and toppings. can buy locally at the Market Square Farmers' Market and other locations. For a quick guacamole, just smash two peeled and seeded avocados, one seeded and minced jalapeno, 2 Tbsp of minced onion, a tsp of fajita seasoning, and a splash or two of lime juice. The folks at DuPont invited me to test drive their Technique Hard Anodized BBQ pan about a month ago. My first impressions were that it is a gorgeous and well designed pan. It has a nice thickness and heft to it. 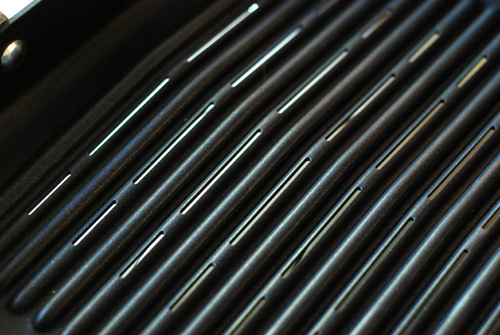 The pan is raised in the center and every other grid has slits cut out to allow heat and smoke to come through. One corner is formed into a spout that facilitates pouring off the collected drippings. The issue that I had was that I had heard that you can't cook with Teflon at high temps like you have on the grill. The DuPont reps advised that this pan can cook at temps up to 500f*. So I fired up my grill and cooked a few dishes on it to test it out. I tried it on gas and charcoal grills. Here is what I thought. Check! 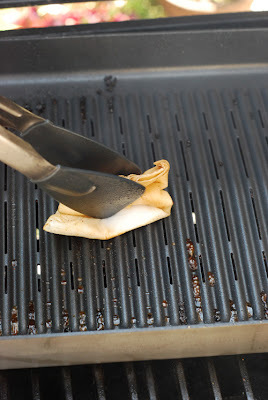 The thick metal did help to even out hot spots from the grill and cooked evenly across the grill pan. 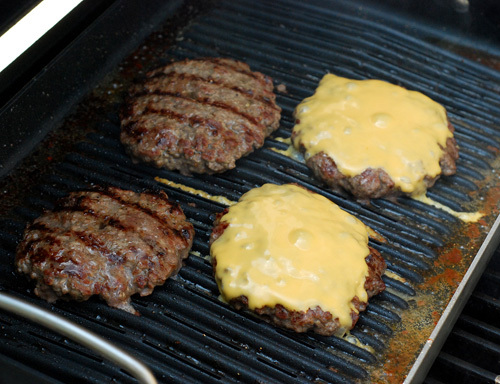 Even at a low temp of 350f, the burgers I cooked still had nice, even grill marks. Check! The angled surface quickly directed the grease away from the meat. 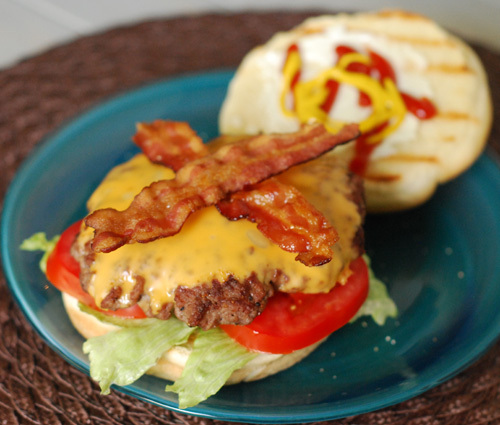 I don't think this gives you a health benefit ("ooooh look, the grease is away from the meat, less fattening!") like a certain indoor grill manufacturer used to tout but it does let the meat grill instead of fry. Check! The cut out grids did let smoke come up through the pan. When I did the chicken, I had a chunk of mesquite in the coals and I could see the smoke wisp up through the slits. Check! I did cook fajitas all at once and no onions falling through the grill grate. You can cook a meal for a family of 4 on this pan. CHECK! I thought this was only going to be about how easy it is to clean the pan surface, which is true. While it is still hot, just wipe it with 2-3 folded, wet paper towels and after that it only needed rinsing with hot water. But even better, all of the rendered fat is kept in the pan but away from the food. 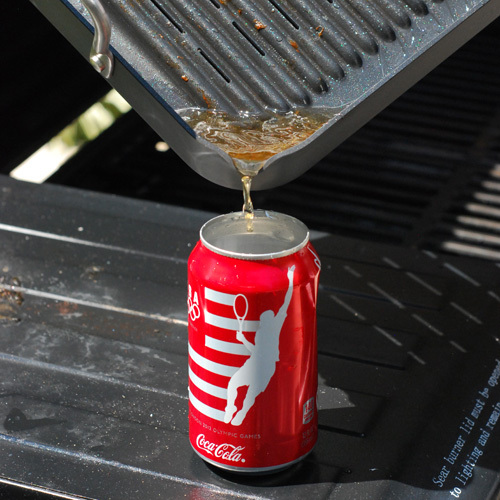 Normally it would have poured down into your grill. For a gas grill, that's a huge mess that will have to be cleaned out eventually. 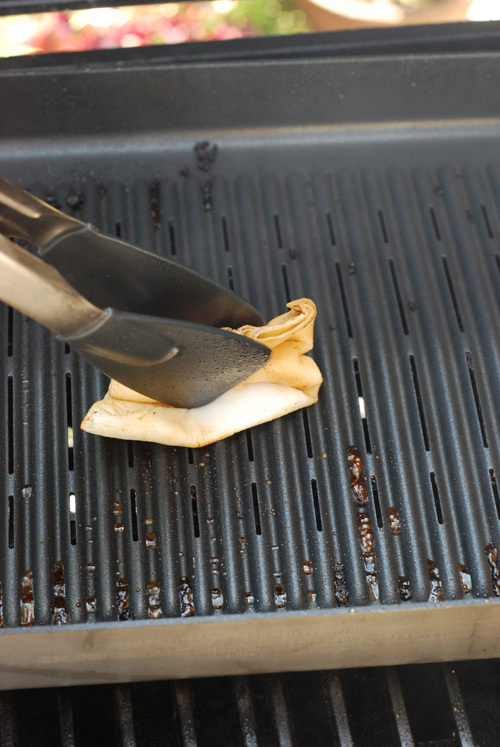 For a charcoal grill, it promotes flare ups which make burned grease smoke, not good eats. Check! 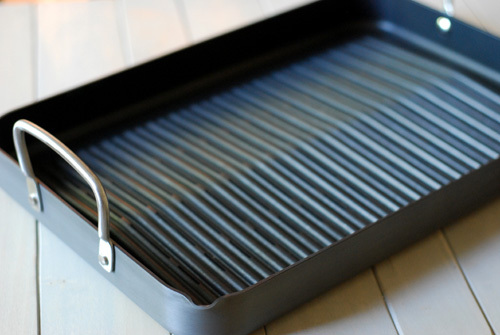 You NEVER use metal utensils with non-stick surfaces, right? 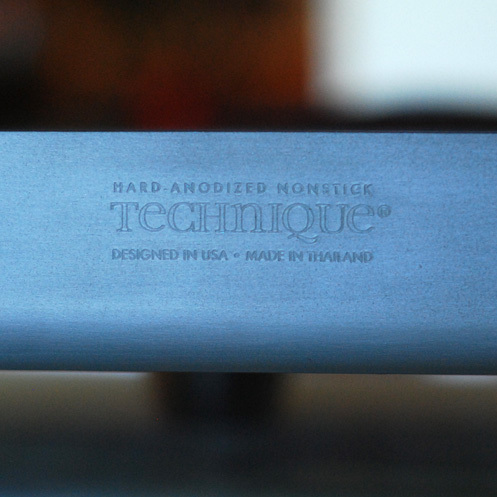 Wrong, DuPont ScratchGuard Teflon used on these pans is twice as tough as stainless steel and can take a beating. using metal utensils so I thought that this would do instead. Revolutionize? I can't check off on that one, at least not for me. 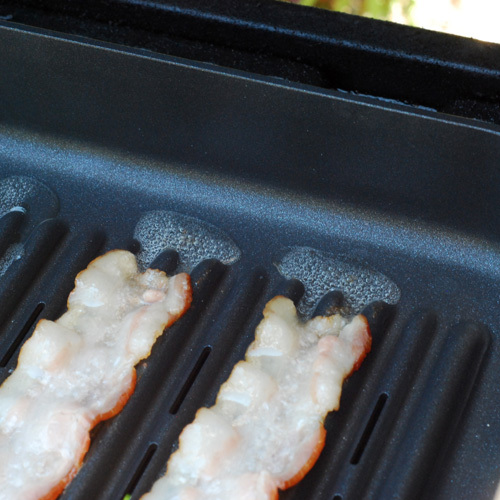 Grilling has been around for thousands of years, so revolutionizing it would be something extreme. But it DOES do what else it says. This pan will fit on most standard gas grills like my Smoke Hollow combo unit. Sadly, it it will not fit in a standard 18.5" sized round grill like our Big Green Eggs or a Weber kettle because of the rectangle shape. Square peg, round hole kinda thing. *Warning - Birds are sensitive to cooking fumes. Although most household pets do not appear to be adversely affected by fumes from overheated non-stick cookware, PTFE coated cookware heated to temperatures exceeding 500f can emit fumes which are hazardous or fatal to birds. Never keep pet birds in your kitchen. Do not leave pan unattended. The cookware should never be heated to temperatures in excess of 1000f as this may cause delamination of the cookware materials. [Standard Disclaimer] I received the grilling pan for review at no cost, but the opinions stated are my own.